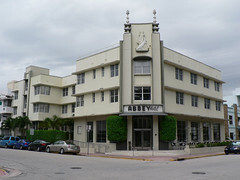 The Abbey Hotel, in Miami’s famed South Beach Art Deco precinct, was built in 1940 to plans by architect Albert Anis. The hotel occipies a corner site with the main door set right on the corner. The name of the hotel is spelt out right above the door. Further up, the roofline features two barber’s poles. The building itself is quite plain with the windows set-back creating strong horizontal banding between each row of windows. The ground floor is coloured darker than the upper two storeys of the hotel perhaps to distinguish between the public and private spaces within the building. There is a deco panel along the side of the hotel at street level featuring a nice representation of a stork. The crowning glory of the Abbey Hotel, however, is the relief of the Salamander on the front of the building above the door. Now you don’t often see a Salamander as decoration on a building but then nothing would surprise me in Miami South Beach. This Egyptian temple was built in 1926-28 by architects M.E and O.H Collins with A.G Porri just a few years after Howard Carter had discovered the intact tomb of the boy-king Tutankhamun. 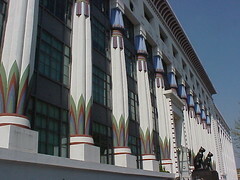 Originally Carreras Cigarette Factory it became an office building in the 1960s losing many of the wonderful Art Deco features. Egyptian inspired Art Deco at its most colourful and those colours are amazing. Blue, red and green at the top and bottom of each column emphasising the lotus flower a common ancient Egyptian design motif. 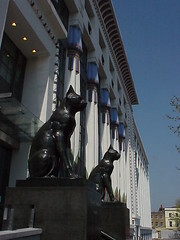 The entrance is guarded by a pair of black cats. These statues stand over a metre tall at the top of a short flights of steps leading up to a modern glass doorway. 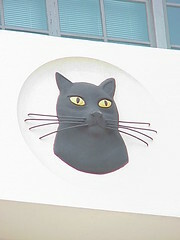 The black cat was the logo of Carreras Cigarettes and is also represented in a series of reliefs along the façade of the building either side of the Carreras name. Seen close up, the reliefs show a cats head with bright yellow eyes and wire whiskers. Now called Greater London House the building was restored in 1999. I found this old Art Deco ad as we detoured off the main road to check out the town of Talbot in goldfields of Central Victoria. You can just make out that is for Henderson’s which I guess was a garage of motor car sales room. I could be completely off the mark and I’d love to find a similar advert in a newspaper to find out more about Henderson’s. 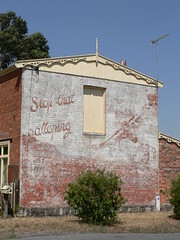 The ad says stop that galloping and a picture of a 1920s car with perhaps a plane flying over it. If you look carefully there is an even older ad painted underneath this one. You can just make out a larger version of the car covering the front part of the small car and stretching up towards the plane. There is also some very faint writing at the top of the ad but I can’t make it out. I like to think this is a true Art Deco that has survived into the 21st Century and just shows you that sometimes you need to step of the well beaten path to find something interesting. The Ararat Advertiser reported on 25 Mar 2008 that the Ararat Rural City Council had adopted a new design for signage on the main road entrances to the town. 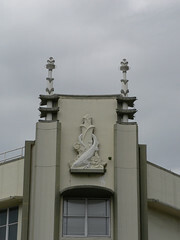 The design incorporates details from Ararat's Art Deco buildings in front of a Mount Langi Ghiran backdrop. It already features on flags in some of the town's roundabouts and three dimensional installations of the new design will be located at each of the five main entry points to the town. Ararat is a former gold-mining town located in rural Victoria on the Western Highway and is recognised as the Gateway to the Grampians. The Advertiser article reports that several Councillors did not like the new design and one even said it left her cold. I love it. The colours are subtle and it uses town Art Deco assets to provide unique branding for the town. The concept of Rural Deco has become quite popular in recent years with the concept most notably at Innisfail in Queensland and Ranfurly on the South Island of New Zealand. 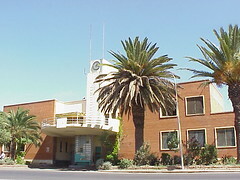 Congratulations to Ararat Rural City Council I look forward to visiting the town in the next few weeks and see their Art Deco buildings for myself. In the middle of a roundabout on Martyrs Avenue, Asmara is a large sculpure of a pair of sandals dedicated to the Eritrean Freedom Fighters who wore these types of shoes during their long struggle against the Ethiopian occupation. Bar Zilli, nearby, looks like a ship sailing right into the middle of the intersection, complete with a row five of porthole windows down each side. While the front could be an oversized Art Deco radio, complete with heart-shaped antenna. Bar Zilli’s radio-style façade curves around the corner and is dominated by a 6x6 grid of windows although two rows have been blanked out. Above the grid, two deep horizontal lines have been cut into the concrete filling the space to the roofline. 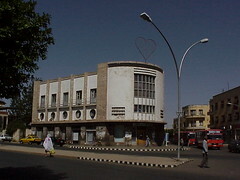 The only other features on the front of the building are two sets of horizontal windows arranged in bands of three similar to the decoration on the Capitol Cinema also in Asmara. As mentioned previously, each side of the building has a row of five porthole windows. Each porthole has a more traditional window above it and is separated from its neighbour by a rounded marble column. The heart on top is an advertisement. 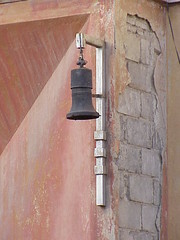 Sorry I can’t tell you what it is for because it is written in the local Tigrinya language. I was flicking around the Foxtel sports channels this morning and noticed that the 3rd Test, New Zealand v England is currently being played at McLean Park, Napier, so I thought I'd write about the Masonic Hotel on Marine Parade. 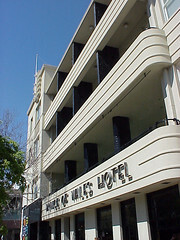 The hotel was built in 1932 to plans by Wellington architect WJ Prouse. It is a long two storey building with a simple wooden pergola on the overhanging balcony. 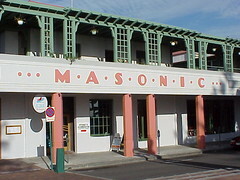 The name Masonic spelt out in a typically deco font. Around the corner is a side entrance marked with a large piece of geometric decoration at the roofline and a glass canopy sheltering the doorway with Masonic spelt out in a joined series of stepped leadlight windows. A few years ago a delivery truck damaged the canopy but I believe it has been repaired. The Masonic's website (it is easy enough to find in your favourite search engine) proclaims Napier's Largest Original Art Deco Hotel and there is a certain deco feel to the website but otherwise I found it very disappointing. There are no photos of the building or details of its history. The Napier Art Deco Trust site on the other hand has a photo of the hotel on their home page but the hotel doesn't even have a link back to them. The Masonic Hotel is a great building, a landmark building and a good place for a beverage after a hot day at the cricket or a sightseeing in New Zealand's Art Deco city of Napier. 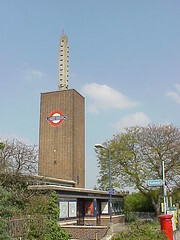 Charles Holden was a British architect who designed many of London’s Underground Stations dating from the 1920s and 30s. Osterley Station, which he designed to replace and earlier station located nearby, opened in 1934. 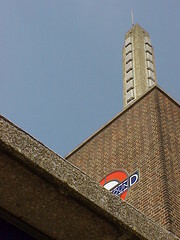 The station is dominated by a tall rectangular brick tower displaying the familiar London Underground logo. This brick tower is topped with a concrete pylon with white square lights set into each side. The rough 'pebble-dash' concrete contrasts nicely to the smoothness of the small brown bricks of the main tower. Osterley is on the Piccadilly line, out towards Heathrow. If you have the time, it is worth getting off at each station and having a look around especially at these outer stations which despite being part of the London Underground are usually above ground and are more likely to be purpose built stations. This is one of my favourite shots of Osterley Station. I think the way the geometric shapes and lines of Holden’s design creates a dramatic image, even if the Underground sign is half obscured. 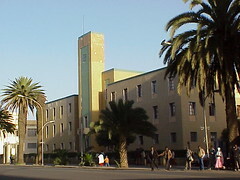 Planned during the 1930s, the Municipality Building in Liberation Avenue, Asmara was built in the 1950s with the third storey being added in 1971. 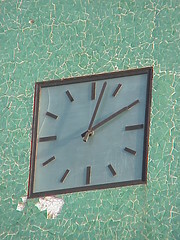 The dominant feature of the building is the clock tower above the entrance faced with a crazy crackle mosaic pattern of green tiles (see close up view below). The tower protrudes from the main bulk of the central section of the building which is slightly taller and set back from the main face. The clock tower and central sections were heightened when the third storey was added to maintain the overall balance. The symetrical wings consist of five windows for each floor with the ground storey windows half the height of the upper floors. The Municipality is set back from the street with a small wall and hedge surrounding a simple garden. The gateway marked with four pillars each topped with a spherical lamp. The Municipality Building is a majestic landmark in central Asmara. 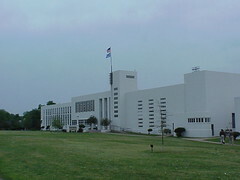 Bartlesville High School was designed by architect John Duncan Forsyth and it was build in 1939. 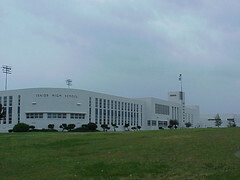 That year is displayed above the central door of the main entrance with BHS above the doors to the left and the right. Just to the right of the entrance there is a large tower with a flagpole on the near corner. The flagpole is connected to the bulk of the tower with seven short horizontal bands which wrap around the square corner. Further to the right is the auditorium marks by the three tall columns horizontal windows. Inside the auditorium has nice clean lines and simple decoration including bands of green and white on the lower part of the walls and a geometric deco design on the sides of the rows of seats. The door plates on many of the doors inside also have a stepped deco design. To the left of the main entrance the building continues with large horizontal window on ground level that wrap around the corner as the next part of the building is stepped back. The second storey windows consist of five vertical columns contrasting the windows below and complementing the vertical windows which make up most of the next part of the building. That part of the school has thin columns of windows reaching almost the full height of the wall giving way to a graceful curved wall at the end of the main block with three horizontal windows and Senior High School spelt out above. The rest of the building stretching around the corner is again made up of thin vertical columns of windows. Bartlesville High School is a fantastic streamline Art Deco building. It’s a shame it was such a rainy day when I got to this part of Oklahoma. It would have been nice to capture the white school against a beautiful blue sky. 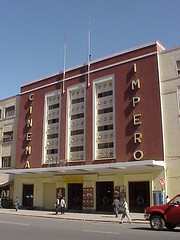 Cinema Impero in Liberation Avenue is probably the most striking of Asmara’s four Art Deco cinemas. 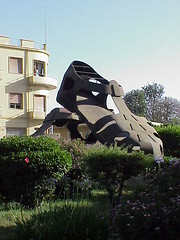 It was designed by Mario Messina and built in 1937. Forty-five round lights decorate the front with the name Cinema Impero spelt out vertically in illuminated letters. It certainly is a landmark building, especially at night. 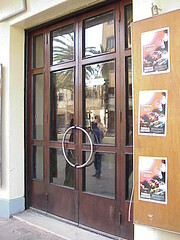 Several pairs of doors lead into the cinema. Each door an impressive large semi-circular handle forming a full circle with its partner when both are closed. I blagged my way in to check out the auditorium and was not disappointed. Initially I was a bit freaked out standing in the pitch black empty space but it was all worth it when the lights came on. The back wall had stylized Art Deco reliefs of impala, while along the side walls there were more reliefs of dancing figures and palm trees. A cordon of squat poles with lion’s heads on top creates symbolic separation of the seats from the movie screen. People started coming in for the next session so I returned to the foyer and left offering sincere thanks to the guys sitting beside the doors. In my opinion, Cinema Impero is one of the great cinemas of the world. The original building was designed by architect RG Oldman in 1921. It housed the local Council Chamber and offices and had a hall which was used for showing silent films. In 1939 architects Kreightmeyer & Rowe significantly altered the building to become a great Art Deco building including a modern cinema. The Council moved out to new premises in 1966 and the building was used as a Reception Centre. Today the Memorial Hall is managed by the Mosman Park Arts Foundation. Near derelict in the 1990s, it has been restored in all its Art Deco glory and forms the centre of MosArts activities including arts classes, gallery, theatre and the Camelot outdoor cinema. On end of the building is a semi-circular tower topped with a large fin bearing the name ‘Memorial Hall’. The fin is highlighted by four short horizontal lines on the face of the tower. Below this are three horizontal bands which wrap around the curve of the tower and continue onto the recessed part of the building above the main entrance. 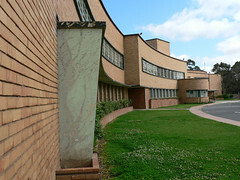 This part of the building has geometric decoration consisting of two rectangular fins with six short bands intersecting across the fins. The bands are semi-circular sitting out from the face of the building. Two horizontal bands lead the eye from the stepped back section of the building to the decoration above the second entrance. This decoration is similar to the first except there are only four semi-circular bands and there is a flagpole between the fins. 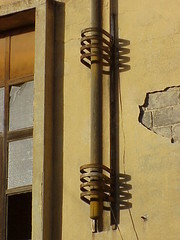 From here a single horizontal band sweeps around the simple curved corner and along the side of the building. A window set high in the wall also curves around the corner. I like the way the architects have identified the building with the large fin on the semi-circular tower then marked each entrance with a decoration on the roofline and used the horizontal banding to link these elements together. The render is falling off exposing the rough breeze block bricks below. The lamps either side of the doorway are broken and the sad flagpoles have seen better days. One is bent at an odd angle while the other has been snapped off just above the roofline. But look Asmara’s Alfa Romeo building in the face and you can’t help but fall in love with her. The familiar Alfa Romeo script is still there in silver against the yellow of the building’s façade. The modest door is surrounded by a huge red rendered frame and the broken lights looks like bells and retain a certain Art Deco charm. The supports for the flagpoles are arranged as two separate groupings of four metal bands providing simple elegant and function decoration. It probably dates from the mid 1930s and one day, I hope someone will add some polish and turn her back into a true Art Deco gem. 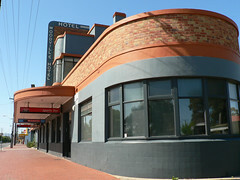 The Woodville Hotel is one of a number of Art Deco buildings on the Port Road in Adelaide, South Australia. The name of the hotel is spelt out in the front in a typical Art Deco font and vertically on the large fin or sail but in a different style. A covered balcony provides a shaded outdoor seating area while the verandah over the footpath provides shade for the ground floor windows. The verandah has press tin cladding in a deco zig-zag pattern. This photo is my favourite view of the hotel. The curved ends of the building itself and the verandah contrast nicely with the straighter angles of the large fin and the stepped roofline up to the chimney. I also like the contrast of the raw red brick against the blue-gray rendered parts of the building. 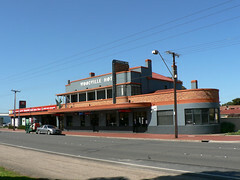 In a way, the Woodville Hotel looks like a ship sailing along the road towards Port Adelaide. 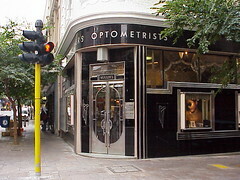 Muller’s Optomerists is a great little Art Deco in downtown Cape Town. The original building was built around the turn of the 20th century with the front added around 1920. The combination of silver chrome and black surrounds really makes the front of this shop. The door combines glass, and metalwork in a very stylish way. The bottom part of the door is metal, I guess to guard against an errant foot while the top two thirds are is glass with a thin metal frame dividing the pane and creating an overall curved look. Having it set into the curved edge of the building allows Muller’s to take ownership of their corner. Beside the door and on the side of the building is a fantastic silver deco ornament. 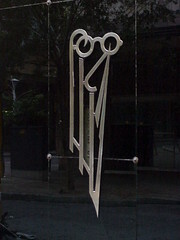 A conglomeration of geometric shapes topped with a pair of round spectacles. Also along the side there are bands of silver lines. One 'steps' between the upper and lower windows while a second underlines the lower series of showcase windows. Muller's is a modest building but it packs a lot of style. Originally a guesthouse in the 1860s, The Prince of Wales Hotel on the corner of Fitzroy and Acland Streets in the Melbourne seaside suburb of St Kilda is an institution. 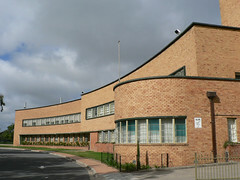 The current building, dating from 1936, was designed by architect R.H. McIntyre. I remember the POW as a great place to see bands, it still is. Since the building was remodelled as The Prince Complex in 1999, it has managed to retain it’s link with the St Kilda people and The Prince Bandroom still features the best of Alternative music. The building itself is four storeys tall with three streamline balconies which emphasis the horizontal lines of the facade. The corner is rather plain but the tower above the entrance is topped with simple geometric decoration and a flagpole. 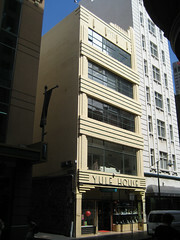 Yule House, designed by architects Oakley & Parkes, is a sweet little building in Little Collins Street, Melbourne. 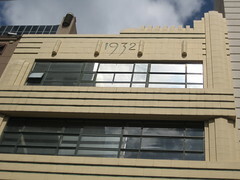 It was built in 1932 as can be seen by the year inscribed high on the facade of the building. The building is primarily cream tiles with green highlights. The large metal frames windows stretch almost the width of the building which, to be fair, is not all that wide. The horizontal spandrels between each window sport three dark green 'speed lines'. The columns either side of the building are stepped back and draw the eye you to the asymetrical parapet. There is a lot going on at the roofline. As I mentioned previously the year 1932 is placed in the centre at the top of the building. Either side of the year are 2 rectangular decorative elements making 4 in all. You can see that three 'speed lines' which reach right across the lower spandrels are interrupted on this level and only a short section can be seen on the right hand side. On the left hand side the top of the three lines wraps further around the corner than the two below and this is mirrored in a fourth line which does stretch to the vertical column on the right hand side. That column is where the asymetrical nature of the building really comes to the fore. The column continues past the roofline to become the highest part of the building. The parapet then steps down to the left following the steps in the column itself. Then there is a short horizontal section with a series of rectangular decoration with a final step down to the usual roofline. All this is underlined in green to match the lines on the rest of the building. In a way the spandrel immediately above the entrance echos the very top of the building. The 'speed lines' are again interruped, this time by the name Yule House and there is a fourth line which cover the entire width of the spandrel. This spandrel serves as the base for the stepped vertical columns so unlike the top of the building the do continue to the very edge of the building and are much more visible on the right hand side. In turn, this bottom spandrel is supported by an arrangement of three stepped elements which not only step back towards the building from the street but also towards the edges of the building opening up the view of the windows and entrance. The windows are copper framed and a single door in recessed into the building leading to a small foyer. 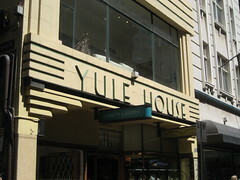 Yule House is again spelt out in the metalwork above the door. I started by saying this is a sweet little building. It sure packs a lot of elements into a tight piece of real estate and it is only 5 storeys tall so it is all laid out before you from street level. I do love the New York skyscrpaers but this is a lovely human scale building and I think it is very special. 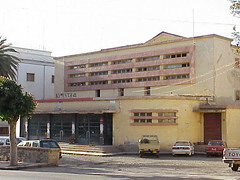 The Capitol Cinema in Asmara is a rather brutal building that looks to me more like a prison than a cinema. The most striking feature is the four bands of small windows with thick conrete frames in the upper part of the facade. Smaller versions adorn the the curved corners of the lower level. 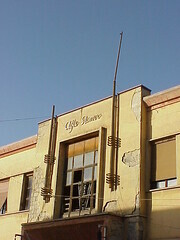 It was built as the Cinema Augustus in 1938 by architect Ruppert Saviele towards the end of the Italian colonisation of Asmara. Surprisingly Asmara, is still a very Italian city. Every corner has a cafe or a bar and the favourite pastime is the passeggiata or evening stroll when it seems whole city take to the streets greeting firends and catching up with that day's events. If a little bit of Italy in an African setting sounds like your kind of place, Asmara fits the bill perfectly. 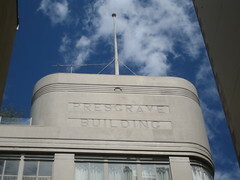 The Presgrave Building is tucked away down Little Collins Street and at first glance looks rather plain. On closer examination, however, you will notice the name spelt out in a pleasant art deco font and a series of strong horizontal elements. Firstly the long horizontal bands of metal windows and then the lines on the spandrels between each band. The are lines on the top of the columns and also on the top and bottom of the each window. Finally at the top corner of the building a rounded tower creates an asymetrical parapet and it too carries a series of horizontal lines. You will also notice the curved windows on the corner of the building which mirror the tower which also curves around the corner. The tower itself has the name of the building chiselled into its surface and is topped with a wooden flagpole. You may even notice that the horizontal lines around the tower are interrupted at the base of the flagpole by a circle motif as if providing a full stop to the buildings identity while echoing the button on the top of the pole. I have often by-passed this building without taking the time to look at it properly. I've come to the conclusion that it is a very stylish Moderne building and in a way it is a shame that Little Collins Street is too narrow to take it all in and really appreciate it. 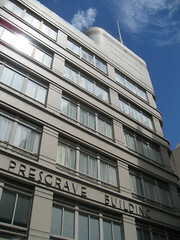 In a more prominent position, the Presgrave Building would truly shine. 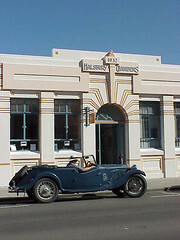 The Halsbury Chambers in Napier, New Zealand's Art Deco city, is a modest single storey building. Located in Tennyson Street, the building is rich in decoratioin, proudly displaying its name above the entrance. It was built is 1932, the year after most of Napier was destroyed by a major earthquake that struck early on the morning of Feb 3, 1931. To me the design echos an earlier time but the arrangement of rectangular decoration and the simple stepped roofline give it a distinctive deco feel. I was lucky the day I took this photo as the sportscar makes it difficult to date the photo. Possibly it was taken shortly after the chambers opened unless you notice the head of the parking metre lurking in the shadows of the doorway. 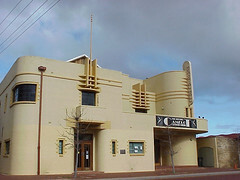 The photo was actually taken in Feb 1999 when Napier hosted the 5th World Congress on Art Deco. 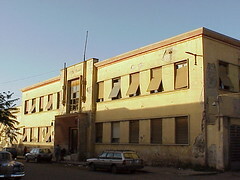 The former City Sanitation Office is on the Massawa Road on the outskirts of Asmara. It was built around 1938 and is now used as an office/garage. The building has symetrical wings constructed in red brick with a entrance topped with a clock tower and a large semi-circular balcont. The clocktower, in turn, is topped by two thin flagpoles. This central section is concrete or rendered and painted white contrasting with the simple red bricks of the rest of the building. Helsinki Railway Station is where I get myself into trouble. Many people will argue that it is not an Art Deco building. I have seen it described as late Finnish Art Nouveau. I don't really care, I think it has some deco elements but what is more important, I like it. 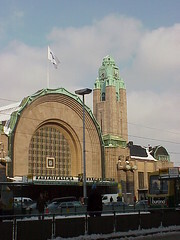 Eliel Saarinen won the competition to design a new railway station for Helsinki in 1904 and over the following ten years the pink granite building was completed. The entrance to the station is placed in a huge arch-shaped wall supported but two rectangular columns. Several stepped arches are laid into the brickwork culminating in a large grid-patterened window above the canopy of the doors. A clock is centred in this window. The arch itself is topped with a copper apron turned green with exposure to the elements. Flanking the doors four statues of mythical giants or gods holding spherical lamps stand welcoming travellers into the station. The figures were designed by Emil Wikstrom and offer a very creative way to incorporate lights onto the front of a building. 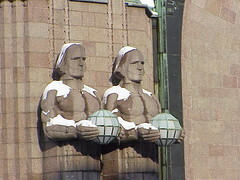 My picture shows two of the statues with snow on their heads and shoulders. 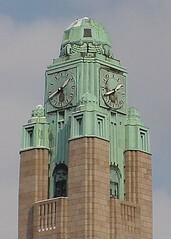 The whole building is crowned by a copper-topped clock tower. The copper work is a collection of simple geometric shapes including several series of stepped rectangles and domed pineapple shapes. (Do you like my technical architectural language?) Above each clock face is a piece of decoration which reminds me of the winged-sundisk motifs of Ancient Egypt which became popular with later architects, especially after the discovery of Tukanhamen's tomb by Howard Carter in 1922. Is the Helsinki Railway Station Art Deco? The short answer is probably 'No', mostly because of the time it was designed and built. I think it does, however, show the development from the organic architecture of Art Nouveau to the more geometric architecture of Art Deco as part of a gradual process over many years incorporating many influences. All art movements take time to evolve there is rarely a big bang which creates a new movement. There is always something that has gone before that has inspired others one way or the other. Maryborough is about two hours drive from Melbourne in the heart of the Victorian Goldfields. Given that the Victorian goldrush was centered the middle part of the 1800s, it is possibly the last place you would expect to find an Art Deco gem. 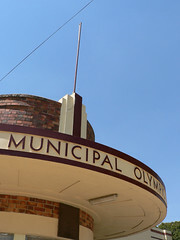 The Municipal Olympic Pool was built in 1939-40 using umemployed and voluntary labour. It was designed by local Maryborough architech E.J. Peck and opened in time for the Australian summer on 7th December 1940 by Sir Frank Beaurepaire. Frank Beaurepaire was Lord Mayor of Melbourne at the time but previously had had a successful swimming career winning 3 silver and 3 bronze medals representing Australia at the London (1908), Antwerp (1920) and Paris (1924) Olympic Games. The complex consists of three outdoor pools. An Olympic size 50m pool and toddler pool were part of the original design while an intermediate pool was added during the 1970s. Like so many Art Deco buildings, the pool features a semi-circular entrance providing space for a cashier office and kiosk with symetrical wings housing the male and female changing rooms. 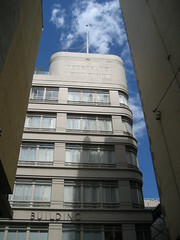 A stepped decoration topped with a flagpole has pride of place above the rounded office windows. 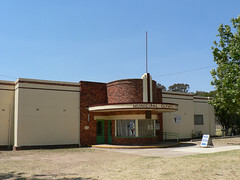 Not so long ago this building was under threat of closure but community action with support from the Art Deco Society in Melbourne led to the complex being restored and is now proudly included as one of Maryborough's attractions. Located on West Terrace, on the edge of the parklands which surround the CBD of the South Australian capital, the Adelaide High School is a stunning building. Built in red brick, architects Edward Fitzgerald and John R Brogan have combined simple geometric shapes to produce this lovely building. Construction began in 1947 when the existing nearby buildings no longer met the needs of the growing high school with the current building opening in 1951. The main entrance is set back from the street protected by a semi-circular office area protruding from the building face. This part of the building is a mass of rectangles of different sizes and heights allowing the building to present itself on multiple three-dimensional planes. The two-storey wing of classrooms sweeping in a elegant curve to the left of the office make the building for me. Even this facade is not a single dimension surface. The first third of the wing juts out several metres from the remaining two thirds. A concrete eyebrow provides shade for the ground floor windows. The continuous horizontal bands of windows accentuate the sleek look of the building. Adelaide High School took my breath away when I got to see it in person. One of my all time Art Deco favourites, but then I've got so many.